Bhai Dooj is the last day of Diwali that celebrates the lovely union between a brother and a sister. On this happy occasion, send this wonderful bhai dooj tikka and Karachi Halwa sweet to your brother and wish him all the success in life ahead. OR Bhai Dooj is the festival of togetherness which is celebrated with fun and excitement. 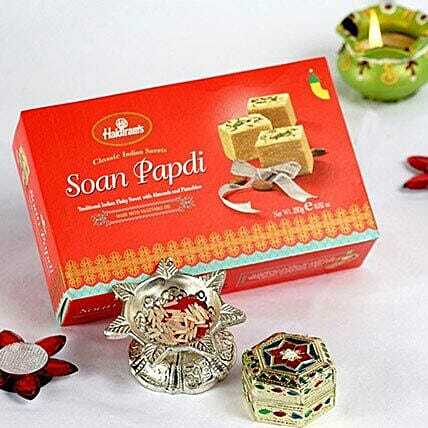 This bhai dooj, send this wonderful bhai dooj tikka along with lip-smacking soan papdi sweet to your brothers settled abroad and let them know how much you love them.